The classy playmaker is tipped to follow his brother Billy into the first team. While Hearts fans have become accustomed to seeing teenagers break into the first team this year, the belief is that Adam King may be the pick of the bunch. The 18-year-old's chances have been limited so far this term, with a substitute appearance in the 7-0 Scottish Cup drubbing against Celtic, and another league appearance against the Hoops in December under his belt to show from his matchday inclusions. Supporters got a first Tynecastle glimpse of the teenager in the fundraising friendly against Wolfsburg in November and with a small squad at Gary Locke's disposal it is anticipated that King will feature more prominently in the second half of 2013/14. The Scotland Under-19 cap was subject of a bid from English Premier League side Swansea in August, with word of his ability starting to spread beyond the walls of Hearts' Riccarton youth academy. King joins brother Billy, a winger, in the Hearts squad, the pair having come through the ranks together at the capital club. Robbie Neilson: "He’s good on the ball, he’s strong and physical and he’s intelligent. Like I say to all the players, he must work hard and be dedicated to the game and Adam does that. "I like his calmness. Being such a young player he brings that confidence in his own ability. Sometimes you have players in that central midfield area who are young and they rush everything at 100 miles an hour but Adam has that composure already. It can take boys into their 20s to develop that already which makes his stand out. "He will have to adapt to the physicality of the Premiership. It can be a big step up. At the moment he is one of the bigger Under-20s players but in a first team environment you have older players that are that bit ahead of him. "But with his natural ability and level-headedness he has got, I don’t see it being too much of an issue for him." 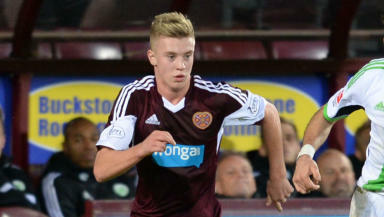 Niall Duffin: "Adam King is great prospect at Hearts. He is mainly a central midfielder but can also play right back and has featured for the Under-20s this season at centre-half. King has a good mix of defensive ability and attacking play and also has a great range of passing. "When Hearts played Wolfsburg in November he was the top performer of the team and impressed many fans. The match demonstrated his ability with the ball at his feet and at one point he dribbled half the pitch beating a number of players. "King is a player who is technically gifted, can provide creativity in central midfield which Hearts have been lacking since Jason Holts injury. He is able to take on a defensive role in the team but also push forward if needs be. "I see an ideal position for him is sitting behind two central midfielders playing a deep lying playmaker role. If he stays at Hearts for the next a couple of years, he does have the potential to be a great player for the club, though as Swansea showed when they bid for him in the summer, he is not short of admirers." You can follow Adam on Twitter @A_king16.